ABSTRACT: The current scenario was to study Polyelectrolyte complex. Polyelectrolyte complexes (PECs) represent a special class of polymeric compounds consisting of oppositely charged polyions that can have either cationic or anionic charges. Due to their charges they are hydrophilic, and normally water soluble, and can be used in a variety of applications, such as drug delivery, coatings, shampoos, or as flocculating agents in water treatment. These complexes avoid the use of chemical cross linking agent thereby to reducing the risk of toxicity. These complex formed is generally applied in different dosage form. A number of different, polymers are used to form polyelectrolyte complex. The present review emphasizes on the detail study on polyelectrolyte complex with their utility in drug delivery. Polyelectrolytes: Polymers that contain a net negative or positive charge at near neutral pH are called polyelectrolyte.3The interaction between the two oppositely charged polymer results in the formation of a complex, termed as polyelectrolyte complexes (Figure 1). Polyelectrolyte complexes (PECs) are formed due to electrostatic interaction between oppositely charged polyions 4. Advantage of polyelectrolyte complex of chitosan with other polymers includes the avoidance of organic solvents, chemical cross-linking agents and thereby reducing the toxicity and undesirable side effects 5.The polyelectrolytes considered all hydrophilic, excluding ‘‘ion containing polymers’’ that are water-insoluble, or polyamphiphiles that are hydrophobically modified 6. Chitosan is the deacetylated derivative of the natural polymer chitin (derived from crab and prawn shells) and hydrogels formed from this material are usually covalently cross-linked 7.Recently, the use of complexation between oppositely charged macromolecules to prepare chitosan beads (or microspheres) as controlled drug release formulation, especially for peptide and protein drug delivery, has attracted much attention because this process is very simple and mild 8. 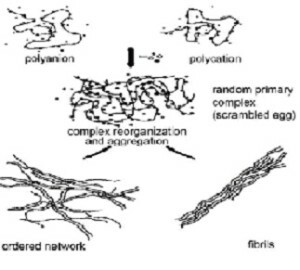 Natural polyelectrolytes: Nucleic acid, Carrageenan, Alginate. Chemically modified polymers: Pectin, Chitin, Cellulose based, Dextran based. Synthetic Polyelectrolytes: Poly (vinyl benzenetrialkylammonium), Poly (vinyl sulfonic acid), Poly (acrylic or methacrylic acid), Poly (styrene sulfonic acid), Poly (acrylamidoalkyl trialkyl ammonium). Polyelectrolyte complex between natural polymers 9: Chitosan has been used for the preparation of various polyelectrolyte complex products with natural polyanions as carboxymethyl cellulose, carboxymethyl dextran, alginic acid, dextran sulfate, carrangeenan, xanthan, pectin, and heparin. Macromolecular interactions between negatively and positively charged proteins have been reported to enhance functional properties including foaming and aggregation phenomena or gelation. The interaction and amount of precipitation varied depending on the concentration of each protein in mixture, the ionic strength and pH of the solution. When soya protein was mixed with sodium alginate, the two polymers interacted to form electrostatic complexes. These interactions improved the solubility and emulsifying activity. Polyelectrolyte complex between a natural and synthetic polymer 9: Formation of polymeric complexes of protein with synthetic polyelectrolyte is of interest to stimulate the intermolecular interactions during the formation of biological system and evidenced by phase separation as a complex coacervates. This is observed by the potassium poly(vinyl alcohol sulfate) and carboxyhemoglobin in the presence of poly(dimethyldiallylammonium chloride), lysozymes and poly(acrylic acid), lysozymes and poly(methacrylic acid), RNA polymerases and poly(ethyleneimine), poly (dimethyldiallyl ammonium chloride) and bovine serum albumin. Polyelectrolyte complex between synthetic polymers 9: Formation of polyelectrolyte complex between synthetic polymers was performed using conductometric, potentiometric or turbidimetric titration. The preparation of three types of PECs formed between poly (vinylbenzyltrimethyl-ammonium chloride) and poly (methacrylic acid) have been reported. The stoichiometry of the reactions between polyanions and polycations has been investigated. It was found that they reacted almost stoichiometrically to give a polyelectrolyte complex. Electrostatic interaction between protein and nucleic acids. Complex formation between polyions and surfactants 10, 11: Polymer-surfactant complexes have proved to be very interesting because they offer intriguing similarities with biological assemblies. For ionic surfactants above the critical micelle concentration, the complexation is a consequence of the coulombic interaction of the polyions and charged micelle. Polyelectrolyte-surfactant complex made up of poly(styrene sulfonate) and different alkyltriammonium derivatives have been synthesized by common precipitation in water. Redissolved in polar organic solvents, these complexes show polyelectrolyte behavior. Air atomization technique: Alternatively the beads can also be prepared by vibration system or air atomization method. Relatively smaller droplets can be formed using a vibration system or air atomization method to extrude the polyanions solution. The later involves a Turbotak air-atomizer. Pressurized air is fed to mix with the polyanions solution, forcing tiny liquid droplets out through the orifice of the nozzle. The cations cross-link the droplets of polyanions on contact to form droplets, which were further cross-linked by Polyelectrolytes such as poly-L-lysine to form a membrane on the droplets. Microparticles obtained using this method were within the size range 5-15 μm. This method requires special extrusion device or atomization device that can have the disadvantage of the high cost and possible clogging. Formation of Polyelectrolyte Complex: The formation of polyelectrolyte complex is usually but not always independent of the mixing ratio of the two macromolecules and of the order of mixing. Unlike the mixing of the polyacids and a polybases, where neutralization results in a exothermic reaction, the binding between a polycation and a polyanion is nearly a thermal. The driving force of the complex formation is largely entropic owing to release of micro ions. Cooperative effects facilitates the ion pairing, since the formation of one cross linked promotes interaction of adjacent charges because of their force proximity. Hydrophobic interaction between polymer backbone of substituent contribute of the complex forming process 21. The general conception is that the main driving force of complex formation is the gain in entropy caused by the release of low-molecular-weight counterions. Other interactions, such as hydrogen bonding and hydrophobic interactions, can also contribute to the complexation process (Figure 2) 22. Formation of polyelectrolyte complexes directly depends on the degree of ionization of cation- and anion-polymers, the density of charges, charge distribution over the polymer chain, concentration of polymers, and their ratio, as well as on the duration of the interaction and the temperature of the reaction medium 23. The structure formation is mainly determined by the fast kinetics of the process (less than 5 µs, depending, for example, on the concentrations of polyelectrolytes and low-molecular-mass electrolytes), followed by a slower stage in which chains redistribute to a PEC conformation closer to equilibrium 24, 25. Polyelectrolyte Complexes containing Chitosan: PECs formed by mixing polysaccharides of opposite charge have recently attracted considerable attention because of their potential for use in drug delivery systems as well as in various biotechnological applications. Among them, chitosan is currently receiving a great deal of attention for medical and pharmaceutical applications 16, 17. Chitosan is a natural cationic polysaccharide which derived by partial deacetylation of chitin, the second most abundant polysaccharides in nature next to cellulose 18. Chitosan exhibits a pH-sensitive behavior as a weak polybases due to the large quantities of amino groups on its chain. Chitosan dissolves easily at low pH while it is insoluble at higher pH ranges. The mechanism of pH sensitive swelling involves the protonation of amine groups of chitosan under low pH conditions. This protonation leads to chain repulsion, diffusion of proton and counter ions together with water inside the gel and dissociation of secondary interactions.19 Formation of chitosan hydrogels by polyelectrolyte complexation is an interesting alternative to covalently cross-linked hydrogels. PECs are generally biocompatible networks exhibiting interesting swelling characteristics. Structure and interaction: PECs are formed by reacting two oppositely charged polyelectrolytes in an aqueous solution, as shown in Figure 3. The electrostatic attraction between the cationic amino groups of chitosan and the anionic groups of the other polyelectrolyte is the main interaction leading to the formation of the PEC. It is stronger than most secondary binding interactions, such as those, for example, allowing formation of chitosan/polyvinyl alcohol (PVA) complexes or aggregation of grafted chitosan. Since chitosan has a rigid, stereo regular structure containing bulky pyranose rings, the formation of PEC can induce a conformational change of the other polyelectrolyte, if the latter has a non-rigid structure, e.g. poly (acrylic acid), xylan or collagen. However, the influence of this change on the hydrogel or polyelectrolyte properties has not yet been studied 20. Characterization of Polyelectrolyte Complex: Different methods have been used to investigate the interaction between polymers. Determination of drug loading efficiency 26, Morphological characterization, size of beads, FT-Infrared spectroscopy and Differential scanning calorimetry 27, Turbidity measurements 28,Swelling studies, In vitro release studies 29,zeta potential determination30,Gel fraction 31,viscosity 32,Light scattering 33, 34, NMR and powder X-ray diffraction methods 35,employed to evaluate inter polymer complexation. Recent work done on Polyelectrolyte Complex: Bruno Sarmento et al., 36(2006), prepared Insulin-loaded nanoparticles by ionotropic pre-gelation of alginate with calcium chloride followed by complexation between alginate and chitosan. The inﬂuence of the pH and stoichiometry relationship between polyelectrolytes providing individual particles with a nano-scale size was assessed by photon correlation spectroscopy (PCS) and scanning electron microscopy (SEM). Insulin–polyelectrolyte interactions were assessed by diﬀerential scanning calorimetry (DSC) and Fourier-transform infrared (FTIR) studies. Individual and smaller sizing nanoparticles, around 800 nm, were obtained at pH 4.7 with an alginate:chitosan mass ratio of 6:1. Lee SH et al., 37 (2007), developed a small interfering RNA (siRNA) delivery system with low cytotoxicity and high transfection efficiency, siRNA was conjugated to poly(ethylene glycol) via a disulfide linkage (siRNA-PEG) to prepare polyelectrolyte complex micelles (PECMs) by condensing with a cationic fusogenic peptide (KALA). The extent of gene silencing was gradually increased with increasing nitrogen to phosphate (N/P) ratio and the concentration of siRNA-PEG/KALA PECMs. These results suggest that the formulation of siRNA-PEG/KALA PECMs could be widely applied for intracellular delivery of various therapeutic siRNAs. Shilan Chena et al., 38 (2008), were prepared drug-loaded chitosan (CS) beads under simple and mild condition using trisodium citrate as ionic crosslinker. The beads were further coated with poly(methacrylic acid) (PMAA) by dipping the beads in PMAA aqueous solution. The surface and cross-section morphology and In vitro release of model drug from these beads obtained. According to this study, the ionic-crosslinked CS beads coated by PMAA could serve as suitable candidate for drug site-specific carrier in stomach. F. Biguccia et al., 39 (2008), investigated the influence of polyelectrolyte complexes composed of chitosan and pectin on the release behaviour of vancomycin. 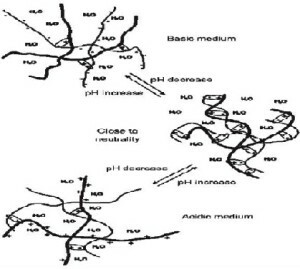 Polyelectrolyte complexes between chitosan and pectin were prepared in various pH regions and at different molar ratios by mixing solutions of pectin and chitosan with the same ionic strength. They performed FT-IR spectra and TGA thermograms to study the degree of interactive strength between polyions. In vitro swelling, mucoadhesion and release tests were performed in order to investigate the chitosan/pectin complex ability in the delivery of vancomycin in the gastro-intestinal tract. The results suggested their possible use for colon-specific localization of vancomycin. Yali Luoa et al., 40(2009), synthesized double-hydrophilic block copolymer composed of poly(N-vinylpyrrolidone) (PVP) and poly(styrene-alter-maleic anhydride) (PSMA) by reversible addition-fragmentation chain transfer (RAFT) polymerization using model drug coenzyme A (CoA) and characterized by gel permeation chromatography (GPC), 1H nuclear magnetic resonance (1H NMR) spectroscopy and FTIR spectroscopy. In acid solution, this block copolymer spontaneously formed polyion complex (PIC) micelles with a cationic polyelectrolyte, chitosan. The PSMA/chitosan polyelectrolyte complex formed an inner core while PVP chains surrounded it as a shell. They found that by manipulating the pH value and salt concentration of the release solution, it was possible to control the releasing rate of CoA. Naidu et al., 41(2009), prepared polyelectrolyte complexes (PEC) of gum kondagogu (GKG) and chitosan by mixing polymeric solutions of different concentrations (0.02–0.18% w/v). The complex formed were loaded with diclofenac sodium, and the release of the drug was measured in vitro and in vivo, along with the measurement of particle size, zeta potential and loading efficiency. They found that PEC showed lower release of diclofenac sodium in 0.1 N HCl as compared to phosphate buffer (pH 6.8). Increasing the concentration of gum kondagogu in PEC led to an increase in drug release. Joung-Pyo Nam et al.42 (2010), prepared Insulin-incorporated nanoparticles by polyelectrolyte complex formation using low-molecular weight water soluble chitosan (LMWSC). Insulin-incorporated nanoparticles showed spherical shapes with a particle size of approximately 200 nm. The nanoparticles characterized for average particle size, drug content and loading efficiency NMR and UV. The zeta potential decreased with increasing insulin feed, indicating that the electrostatic interaction increased with increasing insulin feed. Release study determined that, insulin was released continuously from the nanoparticles over 120h.Consequently, results showed that LMWSC and insulin successively formed polyelectrolyte complexes as a nanocarriers and can be considered a good candidate for insulin delivery. Martin et al., 43 (2011), preparedpolyelectrolyte (PEL) complex (PEC) nanoparticles, by mixing solutions of the low cost PEL components poly(ethyleneimine) (PEI) and poly(acrylic acid) (PAC). It was found, that the size and internal structure of PEI/PAC particles can be regulated by process, media and structural parameters. Finally, dispersed PEI/PAC particles used as additives for the paper making process, as well as for drug delivery. Surface bound PEI/PAC nanoparticles were found to release a model drug compound and to stay immobilized due to the contact with the aqueous prepared release medium. Quan-Fu An et al., 44 (2012), studied needle-like water-soluble polyelectrolyte complex nanoparticles (PEC NPs), consisting of sodium carboxylmethyl cellulose (CMCNa) and poly(methacryloxyethyl trimethyl ammonium chloride) (PDMC), as novel templates for biomimetic mineralization. Barium acetate and sodium sulfate solutions were added simultaneously into CMCNa/PDMC polyelectrolyte complex (PEC) solutions as BaSO4 precursors. Spherical BaSO4 crystals with unique annual ring cross section were synthesized in different concentrations of PEC solution. Energy dispersive X-ray spectroscopy, X-ray diffraction, Fourier transform infrared spectroscopy, and thermogravimetric analysis (TGA) showed that these crystals were composed of ca. 90–95 wt % BaSO4 and 5–10 wt % PEC NPs. Result showed that the rigid needle-like structure of PEC is responsible for BaSO4 morphology. Utility of Polyelectrolyte Complex: People have extensively studied the PECs and their applications for the last forty years. At present, PECs are used for such large-scale industrial applications as flocculants, coatings, and binders and for special purposes in biotechnology and medicine 45. Promising fields include PEC-microencapsulation of drugs, enzymes, cells and microorganisms 46-48, immobilization of proteins by complex formation 49, 50 and polycation complexes with polynucleotides or oligonucleotides as vectors in gene therapy 51-54. Depending on their composition, PECs can be either insoluble or soluble in water. Insoluble PECs show unique efficiency as hydrophilic soil binders, preventing wind and water erosion. Such a PEC composition was used, for example, after the Chernobyl accident to suppress the formation of radioactive aerosols in contaminated dusty areas 55. On an industrial scale, insoluble PECs have been demonstrated to be much more effective than the industrial polyelectrolytes in coagulating colloid dispersions, particularly slag wastes in metallurgy 56. They have been also reported as biocompatible coatings for hemosorbents and other medical items in contact with blood and other biological fluids 57. The development of soluble PECs 58 allowed for a large range of prospective applications of PECs, related primarily to biomimetics, biotechnology and medicine 59-61. CONCLUSION: A wide range of research is going on the polyelectrolyte complex. Polyelectrolyte complex have unique properties to encapsulate the drug without loosing their stability and biocompatibility. Polyelectrolyte complex have great potential and multiple application in future in the field of biotechnology, medicine, pharmaceutical technology and in the design of novel drug delivery system. Kaur J, Harikumar SL: Interpolyelectrolyte complex as prospective carrier for controlled drug delivery. International Research J of Pharmacy 2012; 3:58-62. Lankalapalli S, and Kolapalli. VRM: Polyelectrolyte complex: A review of their Applicability in drug delivery technology. Indian Journal of Pharmaceutical sciences 2009; 71:481-487. Kubisa P: Terminology of polymers containing ionizable or ionic groups and of polymers containing ions, IUPAC recommendations, 2004; (DRAFT 23 December 2004). Philipp B, Dautzenberg H, Linow K, Kotz J, Dawydoff W: Polyelectrolyte complexes recent development and open problems. Prog Poly Sci 1989; 14: 91-172. Naidu V.G.M, Madhusudhana K, Sashidhar R.B, Ramakrishna S, Roop K, Khar, Farhan J, Ahmed, Prakash V. Diwan: Polyelectrolyte complexes of gum kondagogu and chitosan, as diclofenac carriers. Carbohydrate Polymers 2009; 76:464-471.
Cooper C.L, Dubin P.L, Kayitmazer A.B, Turksen S: Polyelectrolyte–protein complexes. Current Opinion in Colloid & Interface Science 2005; 10:52 -78. Lorna N, Alexander I. G, Lubna S, Ijeoma F. Uchegbu: A non-covalently cross-linked chitosan based hydrogel. International Journal of Pharmaceutics 1999; 192: 173 182. Shu X.Z, Zhu K.J: Controlled drug release properties of ionically cross-linked chitosan beads: the influence of anion structure. International Journal of Pharmaceutics 2002; 233: 217–225. Mark HF, Bikales NM, Overberger CG, Menges G: Encyclopedia of polymer science. A Willey Interscience Publisher, Second edition. Vol II:739. Dumitriu S., Chornet E: Inclusion and release of proteins from polysaccharide based polyion complexes. Adv Drug Delivary Rev 1998; 31:223-246. Bhise KS, Dhumal RS, Chauhan B, Paradkar A, Kadam SS: Effect of oppositely charged polymer and dissolution medium on swelling erosion and drug release from chitosan matrices. AAPS Pharm Sci Tech 2007; 8 :2. Dumitriu S., Chornet E: Inclusion and release of proteins from polysaccharide based polyion complexes. Adv Drug Deliv Rev 1998; 31:223-246. Berger J., Reist M., Mayer J.M., Felt O., Gurny R: Structure and interactions in chitosan hydrogels formed by complexation or aggregation for biomedical applications. Eur J Biopharm 2004;57:35-52. Patil J.S., Kamalapur M.V., Marapur S.C., Kadam D.V: Ionotropic gelation and polyelecrolyte complexation: The novel Techniques to design hydrogel particulate sustained, modulated drug delivery system: A review. Digest J. Nanomat. Biostrc 2010; 5:241-248. Liu P., Krishnan T.R: Alginate-pectin-poly-L-lysine particulate as a potential controlled release formulation. J Pharm Pharmacol 1995; 51:141-149. Hugerth A, Ninus CL, Sundelof LO: The effect of charge density and conformation on the polyelectrolyte complex formation between carrageenan and chitosan. Carbohy Polym 1997; 34:149-56. Berger J, Reist M, Mayer JM, Felt O, Gurny R: Structure and interactions in chitosan hydrogels formed by complexation or aggregation for biomedical applications. Eur J Pharm Biopharm 2004; 57:35-52. Sinha V.R., Singla A.K., Wadhawan S., Kaushik R., Kumria R., Bansal K., Dhawan S: Chitosan microsphere as a potential carrier for drugs. Int J Pharm 2004;21:33. Yao K.D., Peng T., Feng H.B., He Y.Y: Swelling kinetics and release characteristic of cross-linked chitoan polyether polymer network (semi-IPN) hydrogels. J Polym Sci 1994; 32:1213-1223. SL Dakhara, CC Anajwala:Polyelectrolyte complex: A pharmaceutical review, Systemic review in pharmacy 2010; 1:121-127. SmolenVF, Hahman DE: A water membrane hypothesis behavior of polycation polyanion salt complexed membrane as appeared lipoidal barrier to solute transport. J Colloid Interface Sci 1973; 42:70-78. Thünemann, A. F., Müller M., Dautzenberg H., Joanny J.F. and Löwen H: (), Polyelectrolyte complexes. Polyelectrolytes with defined molecular architecture. Springer-Verlag Berlin Heidelberg 2004; 166:113-171. Ilina A. V and Varlamov V. P: Chitosan-Based Polyelectrolyte Complexes: A Review. Applied Biochemistry and Microbiology 2005;41: 5–11. Bakeev, K. N., Izumrudov V. A., Kuchanov S. I., Zezin A. B. and Kabanov V. A: Kinetics and mechanism of interpolyelectrolyte exchange and addition reactions. Macromolecules 1992; 25:4249-4254. Bakeev, K. N, Izumrudov V. A, Zezin A. B. and Kabanov V. A: Kinetics and mechanism of the formation of polyelectrolyte complexes. Doklady Akademii Nauk SSSR 1988; 299:1405-1408. Shu X.Z, Zhu K.J. : A novel approach to prepare tripolyphosphate chitosan complex beads for controlled release drug delivery. International Journal of Pharmaceutics 2000; 201:51–58. Moustafine R.I, Kemenova V.A., Mooter G. V: Characteristics of interpolyelectrolyte complexes of Eudragit E-100 with sodium alginate. 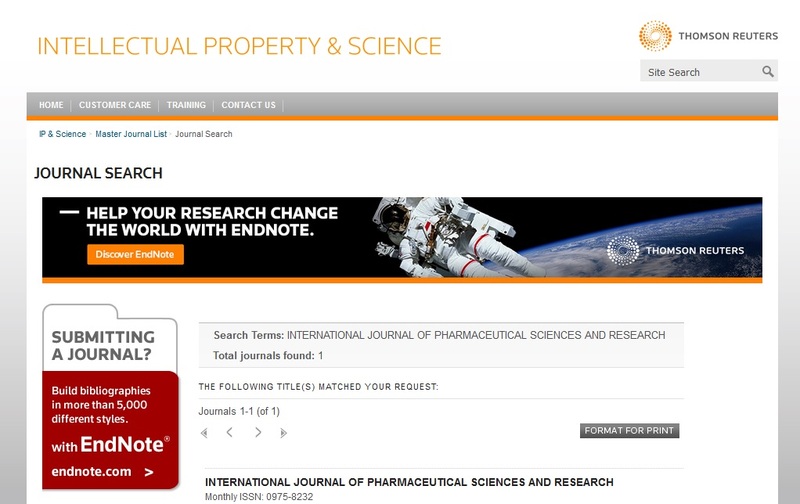 International Journal of Pharmaceutics 2005; 294: 113–120. Biguccia F., Luppia B., Cerchiarac T., Sorrenti M., Bettinetti G., Rodrigueza L., Zecchia V: Chitosan/pectin polyelectrolyte complexes: Selection of suitable preparative conditions for colon-specific delivery of vancomycin. 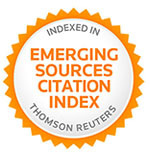 European journal of pharmaceutical sciences 2008; 3: 435–441. Naidu V.G.M., Madhusudhana K., Sashidhar R.B., Ramakrishna S., Roop K. K, Farhan J. A., Prakash V. D: Polyelectrolyte complexes of gum kondagogu and chitosan, as diclofenac carriers. Carbohydrate Polymers 2009; 76:464–471. Shilan C, Mingzhu L, Shuping J, Bin W: Preparation of ionic-crosslinked chitosan-based gel beads and effect of reaction conditions on drug release behaviors. International Journal of Pharmaceutics 2008; 349: 180–187. Zhang L.M: Synergistic blends from aqueous solution of two cellulose derivatives. Colloid Polym Sci 1999; 277:886-890. Herbert D: Light scattering studies on polyelectrolyte complex. Macromolecular Symposia 2001; 162: 1-22. Natalia VP, Nickoley VT: Stricture and dynamics of the polyelectrolyte complex formation. Macromol 1997; 30: 4897-904. Anlar S., Capan Y., Guven O., Gogus A., Dalkara T., Hincal A., Formulation and in vitro evaluation of buccoadhesive morphine sulfate tablets. Pharm Res 1994; 11:231-236. Bruno S, Domingos F, Francisco V, Ribeiro A: Characterization of insulin-loaded alginate nanoparticles produced by ionotropic pre-gelation through DSC and FTIR studies. Carbohydrate Polymers 2006; 66:1–7. Lee SH, Kim SH, Park TG: Intracellular siRNA delivery system using polyelectrolyte complex micelles prepared from VEGF siRNA-PEG conjugate and cationic fusogenic peptide. Biochem Biophys Res Commun. 2007; 357:511-516. Mingzhu L., Shuping J., Bin W: Preparation of ionic-crosslinked chitosan-based gel beads and effect of reaction conditions on drug release behaviors. International Journal of Pharmaceutics 2008; 349:180–187. Biguccia F, Luppia B., Cerchiarac T., Sorrenti M., Bettinetti G., Rodrigueza L., Zecchia V: Chitosan/pectin polyelectrolyte complexes: Selection of suitable preparative conditions for colon-specific delivery of vancomycin, European journal of pharmaceutical sciences 2008; 3:435–441. Luoa Y., AirongW., Jinfang Y., Qingyu G., Preparation, characterization and drug release behavior of polyion complex micelles. International Journal of Pharmaceutics 2009; 374:139–144. Joung-P N., Changyong C, Jang Mi-K, Young-I J, Jae WN, Sung H K, Yoonkyung P: Insulin-incorporated chitosan nanoparticles based on polyelectrolyte complex formation, Macromolecular Research 2010; 18: 630-635. Martin M, Bernd K, Johanna F, Sebastian P and Bernhard T: Polyelectrolyte Complex Nanoparticles of Poly(ethyleneimine) and Poly(acrylic acid): Preparation and Applications. Polymers2011; 3:762-778. Zhi-Wei S , Quan-Fu An, Qiang Z, Yong-G S and Qiang Z: Study of Polyelectrolyte Complex Nanoparticles as Novel Templates for Biomimetic Mineralization. Cryst. Growth Des 2012; 12:2382–2388. Abe K. Ohno H., Nii, A. Tsuchida, E: Calorimetric study on the formation of polymer complexes through electrostatic interaction and hydrogen bonding. Macromol. Chem1978; 179: 2043-2050. Kříž, J, Dybal J., Dautzenberg, H: J. Phys. Chem. A 2001; 105:7486-7493. Kříž, J, Dybal J. Kurková. D: J. Phys. Chem. B 2002; 106:2175-2185. Sharp K. A, Friedman R. A., Misra, V., Hecht, J., Honig B: Biopolymers 1995; 36:245-262. Dautzenberg, H: Macromolecules 1997; 30:7810-7815. Spink, C. H., Chaires, J. B: J. Am. Chem. Soc 1997; 119:10920-10928. Raju B. B., Winnik, F. M., Morishima, Y: Langmuir 2001; 17:4416-4421. Liler M: Reaction Mechanisms in Sulphuric Acid and Other Strong Acid Solutions, Academic Press, London and NY, 1971. Farhat T., Schlenoff J. B: Langmuir 2001; 17:1184-1192. Dubas S. T., Schlenoff J. B: Macromolecules 1999; 32:8153-8160. Farhat T., Yassin G., Dubas S. T, Schlenoff, J B: Langmuir 1999; 15:6621-6623. Lowack K., Helm C. A: Macromolecules 1998; 31:823-833. Schlenoff J. B., Ly H., Li, M: J. Am. Chem. Soc. 1998; 120:7626-7634. Sui Z., Schlenoff J. B: Solubility study if pH-reversible Polyelectrolyte complexs. PMSE Proc. ACS 2003; 88: 408-409. Sui Z., Salloum D., Schlenoff J. B: Langmuir 2003; 19:2491-2495. Dubas S. T., Schlenoff J. B: Macromolecules 2001; 34:3736-3740. Farhat T. R., Schlenoff J. B: J. Am. Chem. Soc 2003;125:4627-4636.